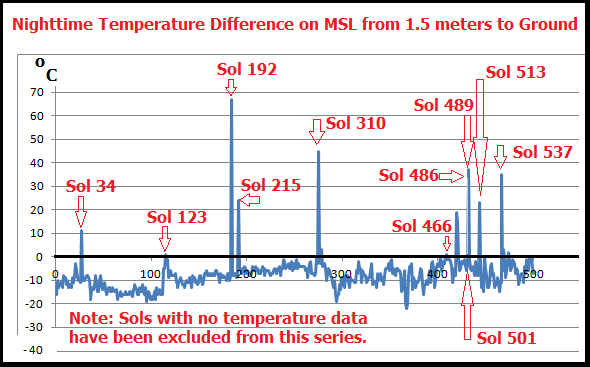 This article looks at the variation between air and ground temperature for 500 sols (Martian days) at MSL Curiosity from landing to Sol 570 on March 14, 2014. For the missing days there was no data reported. The initial assumption was that with the thin atmosphere generally accepted (before our research began) the daytime rate of heat loss between the ground and the mast at a height of 1.5 meters above ground level would be fairly consistent with little variation. Likewise the ground would cool faster than the air at night and this would also be consistent. It was hypothesized that a large amount of variation especially at night would suggest a more complex atmosphere with a higher density than what NASA claims. In fact, as Table 1, its supporting graphs and data show, during the days there was a standard deviation of 6.625442 °C (about 11.92 °F) in general heating of the ground as attention shifted from the mast to the ground where it was about 12 °C warmer, and during the night there was a standard deviation of about 9.1949 °C (16.55 °F) in general cooling (with notable exceptions at sols 34,123,192,215, 310, 466, 486, 489, 501, 513, and 537) as attention shifted from the mast to the ground where it was about 7.774 °C cooler. 12.03 °C for 500 sols; 12.1683°C if Sol 502 is excluded. CHANGE IN TEMPERATURE DURING DAYLIGHT AT MARS SCIENCE LABORATORY BETWEEN AIR AT 1.5 METERS ABOVE GROUND LEVEL AT THE GROUND.